Jerusalem T&T Ltd. was established in 2003 when its founders who were among the leaders in the tourism business at the time decided to form a new entity with emphasis on service and quality. Jerusalem T&T combines the more than 60 years of experience in the travel business with the enthusiasm and drive to provide the ultimate in service and quality. The company is located in the center of Jerusalem, a walking distance from all the Holy Sites in the city. Jerusalem T&T has partnerships with travel agencies throughout the Middle East and provides services to clients all through the region. Our services vary based on the needs of our clients. Our main concern is to make our guests in the Holy Land and in all the destinations we serve feel at their home away from home. We are there for our clients and our guests at all times of the day and night. 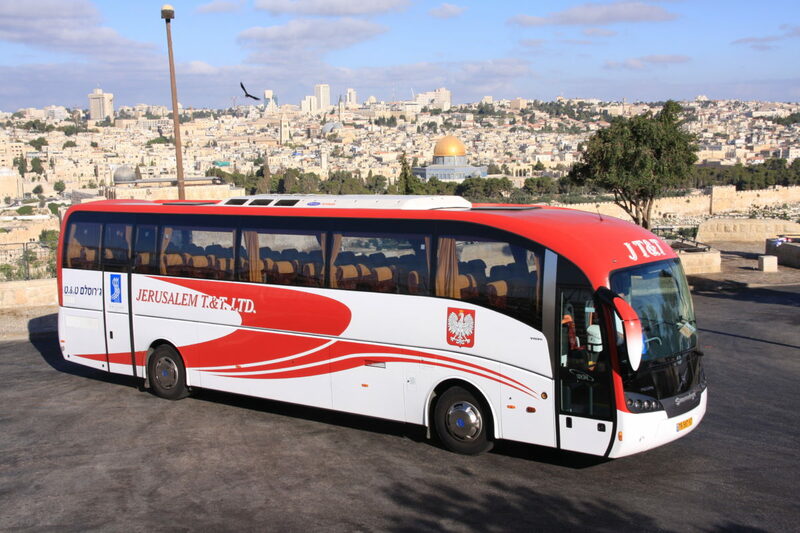 We offer our clients all the arrangements they require through our fleet of luxury tourist coaches in the Holy Land. In addition, our professional staff always strives to go where no one has gone before in terms of the level of service they always provide. Our staff consists of a team of highly professional highly motivated individuals whose main objective is to care for our clients’ needs before their arrival, during their stay and after their departure. Yes, we do look at the smallest details because we know that no matter how small, it matters. We know that this is a purely human industry we are in, and all our staff is focused on this point. Our reputation in the religious travel industry distinguishes us from the rest. Longevity in this business is the direct result of consistently providing exceptional customer service. The professional staff at Jerusalem T&T is dedicated to maintaining the company’s high standards by working diligently, one detail at a time, to provide our clients with memories that last a lifetime. We carefully evaluate the needs of each individual client or group and work hard, not to just meet their needs but to exceed their expectations! That is how we have earned our extraordinary reputation, and that is why our valued clients turn to us again and again. Our MICE services provides our clients with full companionship in all the phases of the arrangement and completion process. We are fully aware that arranging and preparing for a successful event does not only mean completing all travel arrangements to our clients. Our team is involved in every detail throughout the events, from online registration management to onsite support; or from designing team building activities to theme dinner arrangements; we are always in highest professionalism and ready to offer our travel expertise to our customers. We also offer comprehensive leisure travel services for corporate employees. The beauty of our country and its diversified geography allows us to provide the employees of our corporate customers a differentiated array of high level services that will help them get the most of their vacations. Our mission is not only to exceed expectations, not only to look for the WOW. Our mission is to explore new frontiers, to seek out new and previously undiscovered levels of service, and to boldly serve as no one has served before. That is what we call RELIABILITY.